Jim Mallinder feels Saints’ hard work on their attacking game is starting to pay dividends. Mallinder’s men scored six times against Worcester Warriors last Saturday, with Tom Collins grabbing a hat-trick. 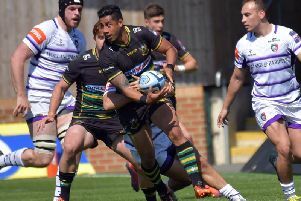 Saints have now racked up 10 tries in their past two home games and have also played some good rugby on the road, scoring six times in their past two away matches. And ahead of Saturday’s game at Saracens, Mallinder said: “We talked about improving our attacking game and I do think part of that was down to the weather, it doesn’t help, but now the pitches are firming up a bit and that makes tries a lot easier to come by. “We’ve scored a lot of tries in the past two home games. “We were disappointed with some of our performances previous to that. “We’d got some decent wins here (at Franklin’s Gardens), but we had to battle. Mallinder made four changes for the game against London Irish, with Collins, Ken Pisi, Victor Matfield and Teimana Harrison, who came in for Sam Dickinson at No.8, all getting a start. And the alterations worked for Saints, with the quartet playing leading roles. “It was time to give Sam Dickinson a rest because he’s worked really hard for us, week in, week out,” Mallinder said. “We had him on the bench, but didn’t use him because we thought that was the right thing to do. “Teimana came in and had a cracking game. Some of his carries were very good. “Victor led out set piece well, our lineout was very accurate and he played for 80 minutes, which is a good ask for him.